The white brick and stone hotel anchors a regrade scene from 1906 or 1907, with an early library and a doomed theater. 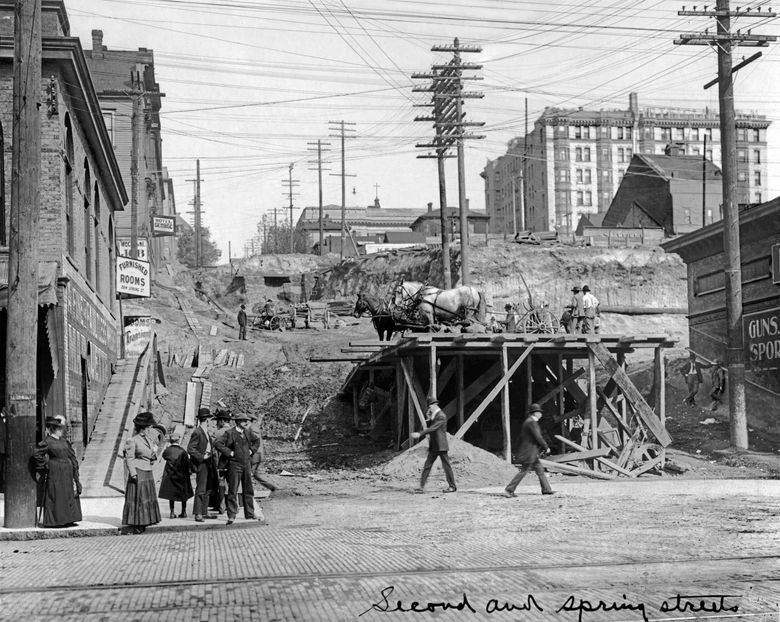 PENNED ACROSS THE bottom-right corner of this week’s “Then” photo is its location: Second and Spring streets. The caption is easily confirmed by landmarks and signs. For instance, the street name, “Second,” is nailed to the power pole on the left. This view looks east up Spring Street from Second Avenue. 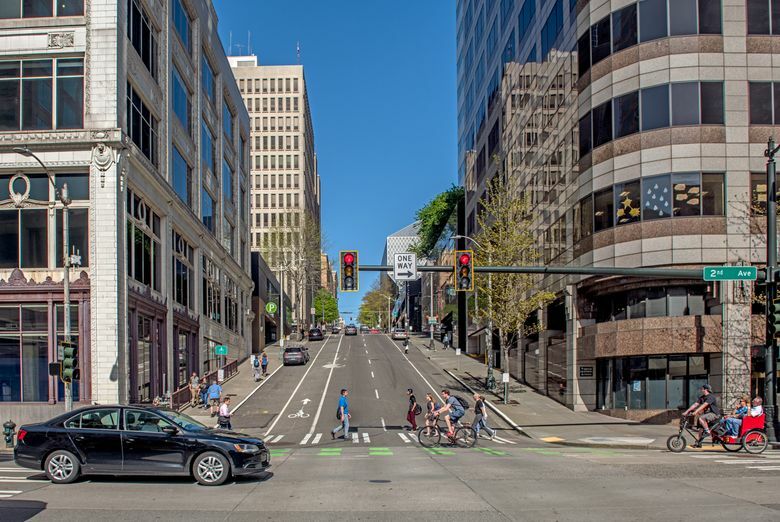 Most historical photographs of the Central Business District record the relatively long avenues that run north and south along the western slope of First Hill. The streets climbing the hill are wonderfully revealed from Elliott Bay, but not up close. With Seattle streets, pioneer photographers gave some interest to Mill Street (Yesler Way), Madison Street and Pike Street. The others were given less regard. This look up and through the regrade upheaval on Spring Street includes small parts of structures that in their time were proudly considered landmarks. Also unsparingly revealed here, upper right, is one big landmark: the Lincoln Hotel. Covered with white bricks and stone, it stood for 20 years at the northwest corner of Fourth Avenue and Madison Street after opening in 1900. It was called “Seattle’s first apartment hotel.” For the generally upscale tenants, it offered a lavish pleasure garden on the roof. But the Lincoln left with tragedy: a sudden fire that killed four, including a father and daughter who jumped together from their sixth-floor apartment to the alley. We will use the hotel to find parts of three more landmarks. First, to the left of the Lincoln, we locate Seattle’s central library, the largest of the Seattle libraries built with an Andrew Carnegie endowment. We can find most of its roofline, but not much else. Dedicated on Dec. 19, 1906, it faces west from the east side of Fourth Avenue, between Madison and Spring streets. Two buildings later, the public guardian of the vox populi stands in the same place; its northwest corner shines near the center of our “Now” photo. The cross rising here, seemingly from the roof of the library, topped Providence Hospital, another pioneer landmark. The construction began in 1882 on the east side of Fifth Avenue. Fifty-seven years later, the site was fitted with the surviving Federal Courthouse. With some help from what remains of the Third Avenue Theatre, our third landmark, at the northeast corner of Third Avenue and Madison Street, we have pulled circa dates of late 1906 or early 1907 for the “Then” photograph. The barnlike rear of the theater partially hides the west facade of the Lincoln Hotel. The regrade’s deep cuts at Third and Madison left the theater’s front door stranded high above the new grade.